The Villa Farnese was built by the Farnese family and boasts of the lavish fine art decorations and antique collections of furniture at the mansion. 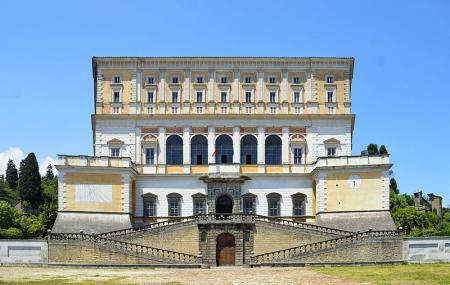 This grand Mannerist and Renaissance structure is also known as the Villa Caprarola. Opening to the volcanic hills of Monte Cimini, this mansion is built on the design of a five-sided plan with reddish golden stone walls and upper floors supported by buttresses. The highlighting features of the Villa Farnese are the Furnace Holdings and the Raphaelesque grotesque frescoes on the arcade. Around the courtyard, you will find the spiral staircases leading to the upper floors and the gallery and among the five staircases, the Royal Stairs or the Scala Regia through the principal floors will catch your attention. Definitely worth a stop if you are in the area. Large, empty, frescoed-filled villa. Interesting interior courtyard and staircase. Small garden. Uphill walk to a very nice palazzino (small villa). Get there early as possible. Arrived at 8:45 on a beautiful late March Friday morning. Left around 10:30. Except for a nice lady who discreetly followed me around, I didn't see another soul the entire time. Upon driving away, tours buses just arrived. Well worth a second visit. I visited villa Farnese at least three times. I can say that I am excited the same way each time. Well kept, and tour guides able to make you feel like diving into the house history. I suggest you to take your family and friends for a guided visit, you won't be disappointed. One of the best properties I have visited. Lots of rooms with frescos and a large garden to stroll around.